tapestry316: A little here and there this Funtry Friday! 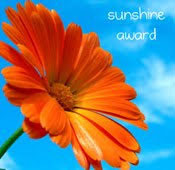 Well, look who is here to sing up the sun, today! Hello, guinea birds - how are you this morning? Care to wander around with me this Funtry Friday? How about a stop at the grocery store. 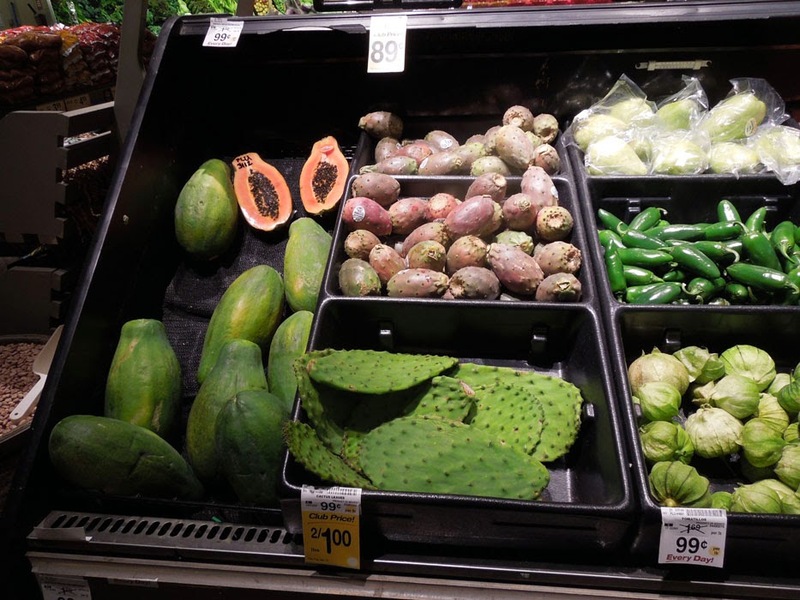 Can you buy these at your Safeway grocery store? I did buy some yummy bell peppers, though, and look what I found when I cut one open! A little tiny pepper sprouted from one of the seeds! I never saw this before - maybe it happened because these are organic peppers. Who knows - but it was really funny to find it inside. It was down right fun to find these pansies when I went to buy hay at the feed store! There were lots of them in all different colors. What a fun Fall splash for the garden! Speaking of colorful splashes, how about a little sunset glow? This time you get to see one of the pilots out for an evening (brrrr cold!) fun flight! Well, the critters and I are all "hunkered down" for the night. Hope you enjoyed strolling around our neck of the woods today! Happy Funtry Friday! Who needs watch dogs when you have guineas! Are yours that noisy? Love the surprise in the pepper and what a beautiful splash of colors. Sigh, my window boxes are empty and I can't imagine why. (lazy!) I used to keep petunias in them and we'd reap the benefits when the windows were open. Your sunset photos are always so beautiful. Do you plan on hitching a ride? Very true! They do let me know when ever anyone is around! I was surprised to see the Pansies at the feed store as it is already freezing at night now. LOL - not hitching a ride on that contraption! Nope! hahaha I'll just enjoy the sunset from the ground! Yup, prickey pears are in our stores, although I've never bought any! 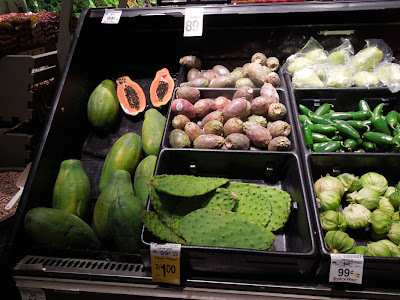 It's always pretty fun to see cactus next to the brussel sprouts!! 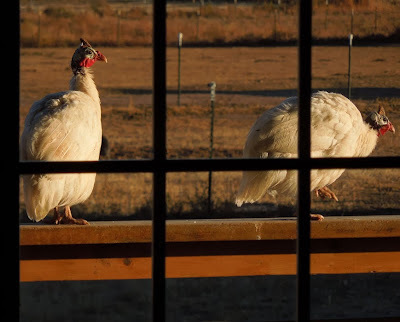 I thought it was funny to see them there, but I guess a lot of people around here eat them. 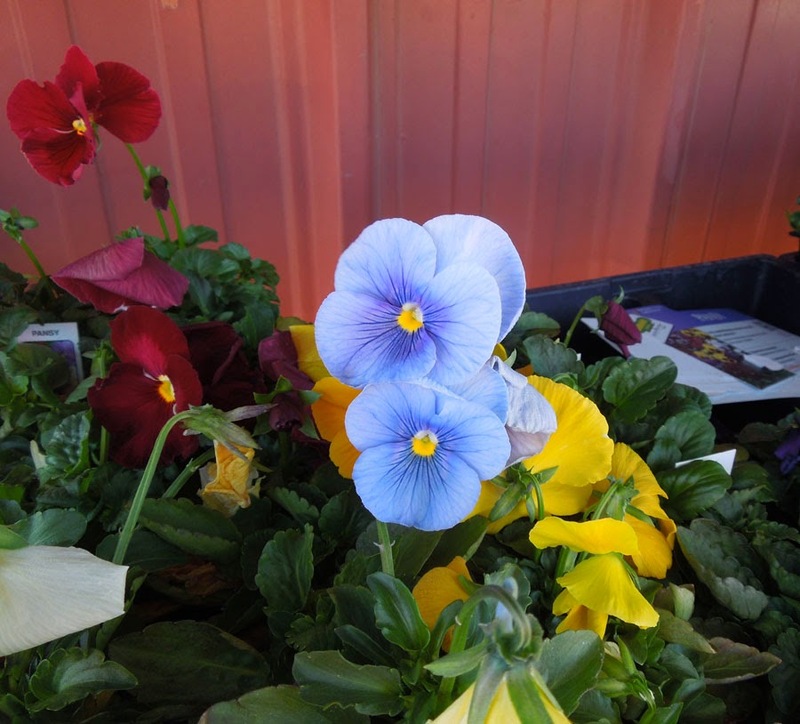 There were so many different colors of pansies - I took some photos and hope to do a painting. They were so pretty. I have made jelly from the fruit, but we never ate the leaves. The fruit is really tangy without some sweetener - lol - I'll take the apple, too! Thanks - I thought they were both pretty, too. 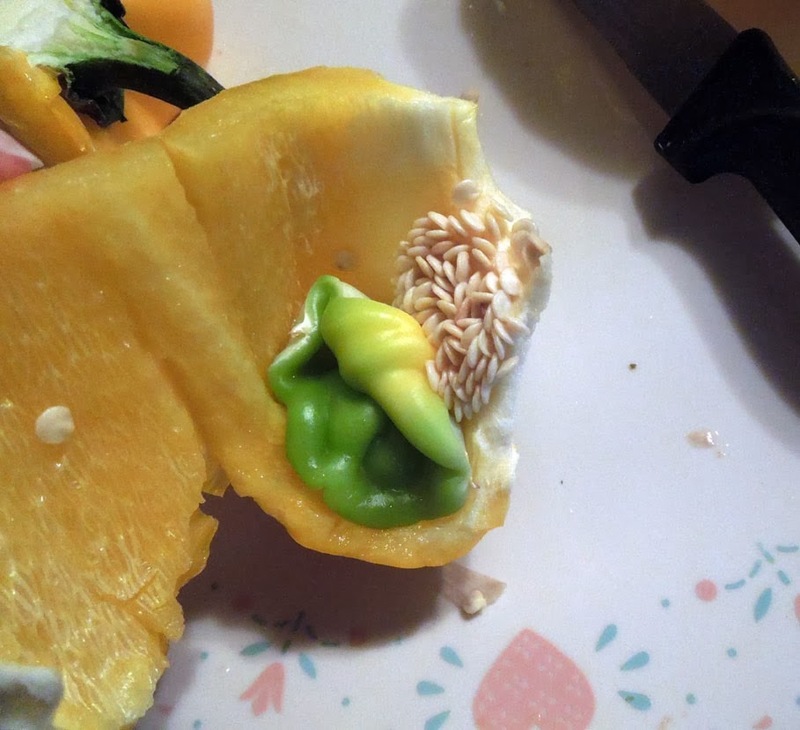 Interesting photos -- how unusual to see the little green pepper inside the yellow one! And the pansies are fun. I envy your gorgeous sunsets -- one of the things I miss about living in the country. Thank you! It was really funny to see the little pepper in there. I have always loved pansies - if it wasn't so cold now, I would think about getting some of them. I am enjoying the sunsets and sunrises whenever I have a chance! Fun photos, That sunset is beautiful!! Funny that a green pepper was inside the yellow one! Love the splash of color... Soon all we will see here is white! Snow is coming... I'm not ready! Brrrrr! Yes, Fall is here for sure! 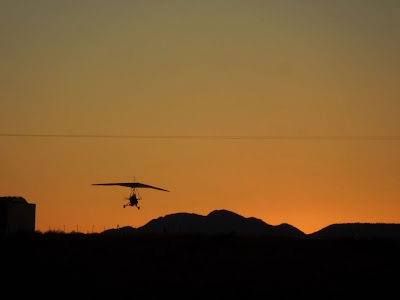 Love the hang glider and sunset! So pretty! Thank you! Even without the clouds, we have pretty sunset colors. How cool to find that little pepper inside! Thank you! It was real cute!